What studies say, why this may be, and what it means. Conventional wisdom says that, as the population ages, degenerative diseases will increase in prevalence, meaning a higher cost to society to treat these diseases. But all may not be what it seems. In 1935, President Franklin D. Roosevelt’s administration created the Social Security Administration, which at the time was a great deal for the government. Workers would pay into the system their entire working lives, but few would live long enough to collect benefits. In the 1930s, life expectancy at birth was 58 years for men and 62 years for women.1 Thus, a mere century ago, most Americans would never live to an age when macular degeneration became manifest, assuming the ophthalmologists of the time could even make such a diagnosis. Most cases of decreased vision were written off as poor eyesight due to old age. How long are Americans living now? According to the Central Intelligence Agency, life expectancy from birth is now 80 years.2 The Social Security Administration, on the other hand, says that a man reaching 65 today can expect to live to age 84, and that women will make it to almost 87 years of age.3 These are ages at which age-related macular degeneration (AMD) is quite common. Common sense, or conventional wisdom, suggests that AMD will increase dramatically, as everyone seems to be living longer these days. But is that what’s really happening? • Two recent studies have reported a decreasing prevalence of AMD in US and European individuals. • Neither study was powered to examine why the prevalence of AMD declined over the past century. • Various factors could have a hand in the trend, but there is no clear answer; if it continues, it could affect the future practice of retina. Two recent papers suggest that conventional wisdom may be similar to modern day political “fake news.” One paper published in Ophthalmology by the European Eye Epidemiology consortium studied European trends.4 A similar study in JAMA Ophthalmology using data from the Beaver Dam Eye Study looked at American trends or, more specifically, at a population group in Wisconsin.5 Unexpectedly, both papers found a decreasing prevalence of AMD. Not what I would have expected. Different continents. Different populations. Same findings. Just as the US FDA requires two confirmatory phase 3 studies before approving a new drug, here we have two independent and concurrent studies with the same results. Statistical mavens can criticize the methodology and results of these studies. They are population-based studies, for one thing. Ethnicity may also play a role, especially given the ethnic diversity in the United States and Europe. Pick a different study population and the results may be different. Nevertheless, two distinct studies found similar results. The question is why. These results fly against conventional thinking about the aging population and chronic degenerative diseases. Is it nature or nurture? Genetics or lifestyle? Genes can’t change in a few generations, rather than needing thousands of years, or longer, to mutate within a population. That leaves lifestyle or environmental factors. Neither study was powered to identify why the prevalence of AMD declined over the past century. Both studies drew parallels to dementia and cardiovascular disease, both of which are related to aging and yet are declining, similar to AMD. This should not be surprising, as all three conditions have common risk factors, including atherosclerosis and inflammation. Think back to the 1950s, when actors and actresses all smoked. When there was a television commercial proclaiming that “Doctors in all branches of medicine” smoked “Camels more than any other cigarette.”8 Half a century later, things are far different. It makes sense that smoking-aggravated diseases such as AMD would decline with fewer smokers. The diet section is one of the largest in most bookstores. Many people have access to Whole Foods and Trader Joe’s and, to make things more convenient, we can have healthy meals delivered to our doors. People are eating well; even fast-food restaurants are serving healthier fare. 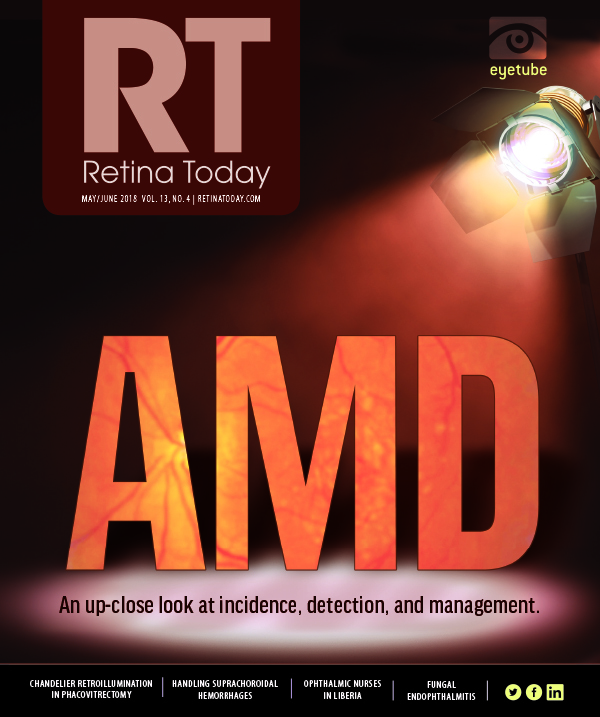 Improved diet and nutrition are likely playing some role in the decline of AMD prevalence. Health clubs are everywhere. Yoga and Pilates studios for those seeking core fitness, and CrossFit and Tough Mudders for the more adventurous. Michelle Obama told everyone, “Let’s move!” Fitbits track our steps. Phone apps remind us to walk. Not everyone is exercising, but many are, and at a higher intensity than previous generations. This may be another factor lowering the prevalence of AMD and related degenerative diseases. Then again, obesity rates are increasing, with more than one in three Americans considered obese.9 This fact of course contradicts the healthy lifestyle rationale for declining AMD prevalence. Are Vitamins Playing a Role? Or Anything Else? The AREDS2 study demonstrated that a particular vitamin combination reduced the risk of developing advanced AMD, but not AMD in general. That doesn’t mean, however, that vitamins don’t play a role in preventing AMD. Such a small effect may not be measurable even in the large AREDS2 study. Almost all of my patients with AMD take vitamins, as do their family members. An uncle with AMD is enough reason for a healthy 40-year-old to take AREDS2 supplements, even if there is no scientific rationale. Might this be playing a role in the reduced prevalence of AMD? The bottom line is that we don’t know why AMD prevalence is decreasing in the United States and in Europe (and likely in other parts of the world). AMD is a multifactorial disease with many risk factors but no single cause. Still, its decline is of interest and important to monitor. If the trend of decreasing AMD prevalence continues, it will certainly have manpower and workforce implications for retina surgeons. Will we be injecting eyes all day long for the remainder of our careers, or will the trend crest and eventually decline? There are also significant policy implications. Medicare and other payers are spending billions of dollars per year on AMD management, particularly on expensive intravitreal injections. Funding is a zero-sum game based on congressional budgets and collected insurance premiums. Money allocated for AMD treatment means payments for other services will be cut. If policymakers believe AMD is on the rise, they will build the budget accordingly, pulling money from our other procedures to make up the shortfall. There is a big difference in a 10-year health care spending budget that sees the prevalence of AMD doubling (conventional wisdom) and one that sees it being halved (as indicated by the data from these two studies). Although our injection clinics are now bursting at the seams, based on these studies, relief may be in sight. Potentially longer-acting injectable drugs, plus fewer patients with AMD, could free up retina specialists from some of the burden of AMD care. 1. Life expectancy for social security. US Social Security Administration. www.ssa.gov/history/lifeexpect.html. Accessed April 5, 2018. 2. Life expectancy at birth. CIA World Fact Book. www.cia.gov/library/publications/resources/the-world-factbook/docs/notesanddefs.html?fieldkey=2102&term=Life%20expectancy%20at%20birth. Accessed April 18, 2018. 3. Benefits Planner: Life Expectancy. US Social Security Administration. www.ssa.gov/planners/lifeexpectancy.html. Accessed April 18, 2018. 4. Colijn JM, Buitendijk GHS, Prokofyeva E, et al; the EYE-RISK consortium and the European Eye Epidemiology (E3) consortium. Prevalence of age-related macular degeneration in Europe. Ophthalmology. 2017;124(12):1753-1763. 5. Cruickshanks KJ, Nondahl DM, Johnson LJ, et al. Generation differences in the 5-year incidence of age-related macular degeneration. JAMA Ophthalmol. 2017;135(12):1417-1423. 6. Trends in current cigarette smoking among high school students and adults, United States, 1965-2014. US Centers for Disease Control and Prevention. www.cdc.gov/tobacco/data_statistics/tables/trends/cig_smoking/index.htm. Accessed April 5, 2018. 7. Adult Smoking Habits in the UK: 2015. Office for National Statistics. www.ons.gov.uk/peoplepopulationandcommunity/healthandsocialcare/healthandlifeexpectancies/bulletins/adultsmokinghabitsingreatbritain/2015. Accessed April 5, 2018. 8. Four out of five physicians prefer Camels. Adweek Blogs. September 24, 2007. www.adweek.com/creativity/four-out-five-physicians-prefer-camels-16855/. Accessed April 5, 2018. 9. Obesity rates and trends overview. The State of Obesity. https://stateofobesity.org/obesity-rates-trends-overview/. Accessed April 5, 2018. 10. Stone NJ, Robinson JG, Lichtenstein AH, et al. 2013 ACC/AHA guideline on the treatment of blood cholesterol to reduce atherosclerotic cardiovascular risk in adults: a report of the American College of Cardiology/American Heart Association task force on practice guidelines. Circulation. 2014;129:S1-S45. 11. Gehlbach P, Li T Hatef E. Statins for age-related macular degeneration. Cochrane Database Syst Rev. 2016;(8):CD006927. 12. Harding A, Gonder U, Robinson SJ, et al. Exploring the association between Alzheimer’s disease, oral health, microbial endocrinology and nutrition. Front Aging Neurosci. 2017;9:398.